Today marks the day that Valkyria Chronicles 4 finally hits store shelves. Beyond just the standard edition of the release, there is also a rather special edition packed with lots of goodies. I managed to snag one of these editions, so let’s take a look what’s inside, shall we? First of all, the box. It is quite big and beautiful, though the slipcover is littered with advertisements about what is inside. I’m not quite sure why they do this to editions with limited supply, as it can cheapen the look of an item you likely paid top dollar for. Taking the slipcase off however, reveals a more subdued look, almost like a soldiers foot locker. It is definitely in line with the game and features some screenshots that are presented as photos sticky taped to the locker. Opening up the box reveals the goodies it contains as well, which look beautiful. One of the main draws to this edition is the tank, which is frankly smaller than I anticipated, but is still an absolutely stunning piece. The ‘Hafen’ as the tank is known in the game seems well crafted, and is painted superbly. Finally, there is a softcover art book here that is presented like the main character Claude’s journal. Although I am not a fan of softcover books included in special editions, the contents of this one more than makes up for the flimsy feel of the cover. So, is this edition worth the asking price? Well, maybe not when compared to other special editions that are out there. This version can cost double the standard editions price in some territories, which makes the cost a bit hard to swallow. 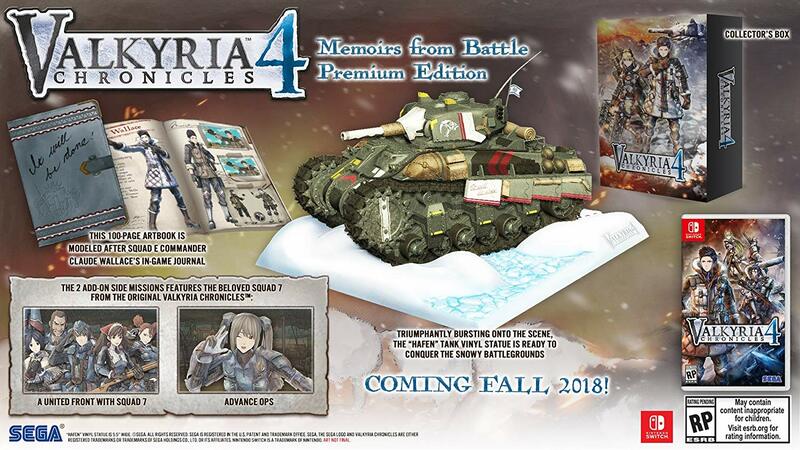 That said, if you are a diehard Valkyria Chronicles fan, then this special edition will likely be a worthy addition to your collection.